Each of these designs can be made with any age you wish, add a note at checkout. 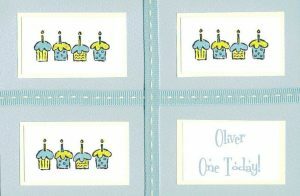 This card is divided into quarters with ribbon. 3 are filled with pretty cupcakes with glittery icing and the 4th quarter has the child’s name and age. 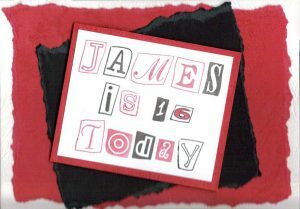 Bold printed card with the recipient’s name and year of birth. Available in a choice of colours – red, sky blue, emerald green, pale pink, hot pink, turquoise. A cake made of flowers with a ribboned tag with the name and age printed on it. On a background of co-ordinating flowers. 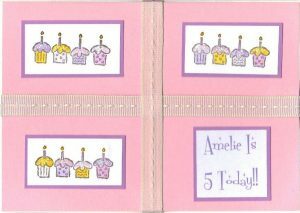 A row of pretty cupcakes, a printed plaque with their name and age, finished with 3 tied ribbons. A girl with her shopping bags and girl stuff – phone, keys, diary, make-up, letters. Finished with the recipients name and age. 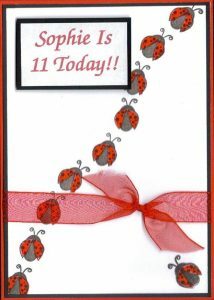 Ladybirds crawl across the front of this card that is finished with a name, age and matching ribbon. 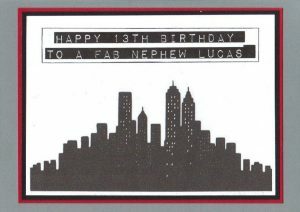 Stylish grey, black and red card with a city skyline and a font that resembles Dymo tape. Printed with a name and age. 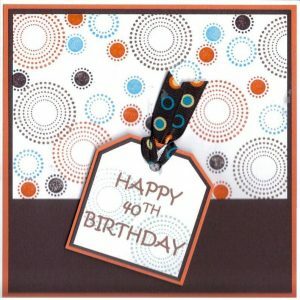 Funky card that can be made with any name and any age. A bunch of bright balloons, finished with a ribboned tag with a name and age upon it. 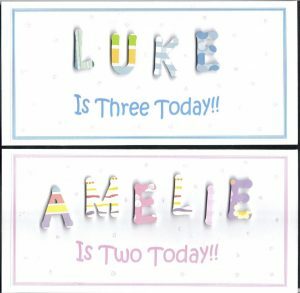 Available in pink or blue with the recipient’s name in raised letters in different patterned papers. 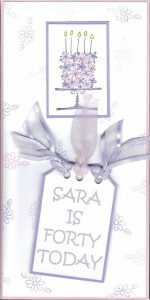 A pretty cake under a glass dome, set on a ribbon with a personalised plaque. 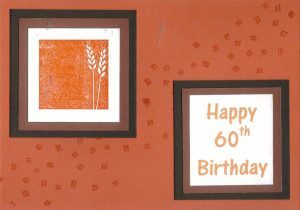 Rustic card with a sprig of barley and a personalised plaque. Great for that special birthday that they’re trying to forget!! 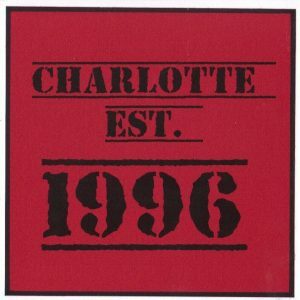 Modern design in black and red with ransom note type lettering. This 18th Birthday card features a map background and a car. The age can be replaced with a different age or simply ‘Happy Birthday’. Map can feature your choice of town. 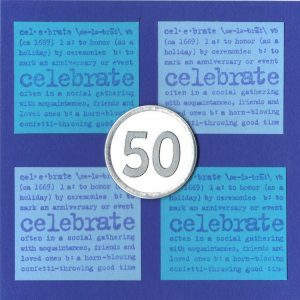 In different shades of blue, this card shows the definition of celebrate with a 50 in a centre circle. 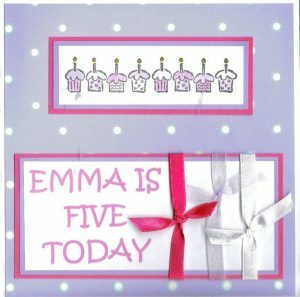 This card can be made for any age.